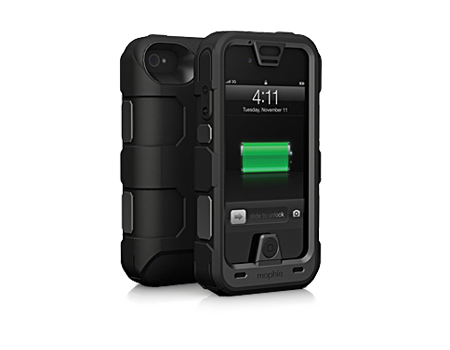 The mophie juice pack PRO is an ultra-rugged 2500mAh battery case and belt clip made for the iPhone 4/4S offering more than 150% extra battery life and exceeding military standards by providing complete protection against drops, dust, dirt, mud, & water. Rechargeable 2500mAh battery extender and protective case in one giving more than 150% extra battery life. Quick recharging speed. Completely recharge iPhone in 1 1/2 hours. 4 LED Light Status Indicator - Tells you how much "juice" you have left in the case for charging. Pass Thru USB - Included micro USB cable allows you to simultaneously charge and sync your iPhone 4/4S to iTunes without ever having to remove the iPhone from the case. This accessory is available for buy online and pickup in store only at this time. Use the "Check In-store Availability" button above to locate the nearest store with inventory available.